This Forza Horizon 3 #Forzathon event started at 1:00 p.m. PT on November 16th and closes at 12:59 p.m. PT on November 23rd. Forza Horizon 4 may be here with its #Forzathon overload but that doesn’t mean Playground Studios has given up on Forza Horizon 3! So here we are, another week and time for another Forza Horizon 3 #Forzathon event! The Forza Horizon 3 #Forzathon November 16-23rd event gives you a chance at the Mercedes 300 Sel 6.3 and the usual XP, Credits, and Wheelspins. 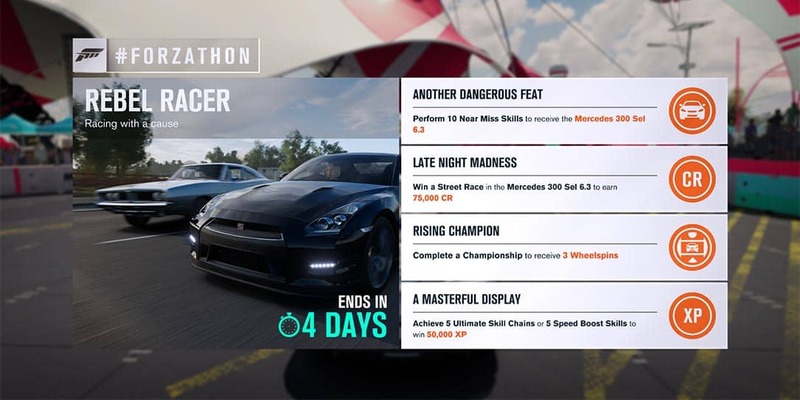 Oh, and don’t forget to check out this week’s Forza Horizon 4 #Forzathon challenges. It looks like Playground Games has shifted the times for their Forza Horizon 3 #Forzathons. This Forza Horizon 3 #Forzathon event started at 1:00 p.m. PT on November 16th and closes at 12:59 p.m. PT on November 23rd. Head to the highway and speed through oncoming traffic to get 10 Near Miss skills. Once completed, you’ll be rewarded the Mercedes 300 Sel 6.3. Next, win a Street Race in your new Mercedes to earn the 75,000 weekly credit bonus. Once that is done, you can set up a short Championship with one lap races, complete it, and receive 3 Wheelspins. 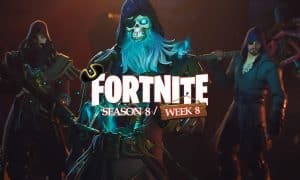 During the previous events, you should hopefully have gotten 5 Ultimate Skill Chains. If not, you can head to the airport or one of the cornfields to bank enough skills in a row to finish off the Ultimate Skill Chain task. You can always head over to Hot Wheels and go over the Speed Boost platforms five times to complete this as well. Once you’ve done either, you’ll snag 50,000 XP. 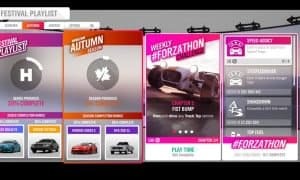 What do you think about the “Rebel Racer” Forza Horizon 3 #Forzathon event? Are you going to keep completing the Forza Horizon 3 #Forzathons or are you moving on to Forza Horizon 4? Let us know in the comments below or on Google+, Twitter, or Facebook.